Kinross celebrates 25 years. This is our culture, our people, our mines, our company. A snapshot of Kinross' 25 years focusing on key moments, accolades and milestones in the Company's rich 25-year history. At Kinross, the heart of our company is our workforce. The Kinross team stretches across four continents, with over 9,000 of us working together, every day, in six languages. We are colleagues, leaders, mentors, partners and friends. We collaborate, challenge and support each other, growing and developing professionally every day. Our diverse backgrounds and cultures strengthen our unity and help us achieve our goals. We are very proud to reach and celebrate this significant milestone. We confidently look forward to accomplishing our goals through hard work and dedication in the 25 years to come. John Oliver, Kinross' Chairman, congratulates the Company on 25 great years. A significant milestone: Kinross Gold has been operating for a quarter of a century. Twenty-five years of growth, value, responsible mining and almost 40 million ounces of gold produced. To celebrate our people and our anniversary, we have profiled some of Kinross' Living Our Values Awards winners, a couple of whom have been with the company for decades. Our people drive our success, and it is their skills, hard work and commitment that will continue to propel us forward. Keeping people safe is very important to Malvina – both at work, in the community and in her family. After witnessing the devastation from the Chernobyl disaster, Malvina risked her life to work as part of a rescue team. This life-changing incident reinforced the importance of safety for Malvina and she knew it was something she wanted to incorporate into her career. Since joining the team at Dvoinoye in 2012, Malvina's contributions have been invaluable. She fosters a friendly work environment with her positive attitude. She proactively seeks opportunities to improve safety at the mine, implementing ideas and improving processes to ensure Dvoinoye operates as safely as possible. A tireless and dedicated champion of health and safety, John has worked at Fort Knox, Alaska, since 1996. John's has an exemplary reputation as a safety leader. He collaborates with Kinross' other North American sites, helps colleagues reach their potential at work and is involved in a wide variety of local community initiatives and non-profit organizations. John is dedicated not only to Fort Knox, but also to his colleagues, community and other Kinross sites; he is a person who is committed to providing support so we can all give and reach our best. As an experienced and skilled underground miner, Anatoliy is a role model for his new colleagues. He happily coaches junior staff and makes it a personal priority to share his experience for the benefit of others. Having strong leaders like Anatoliy on site have far-reaching benefits in areas like safety, innovation and professional development. Anatoliy delivers excellence and encourages development for the betterment of others and the Company. Juan has been with Kinross Chile from the very beginning. For over two decades, Juan has been a critical figure at La Coipa and Maricunga, assuming complex challenges in plant operations in the areas of crushing, milling, tailings, leaching and refinery. Juan is a consummate team player; it is the cohesiveness, and positivity he shares with his teams and colleagues that he finds particularly enjoyable about working at Kinross. He is someone that not only guides his team effectively but also fully motivates and supports them. A problem solver, analytical, calm, team-player, and immensely helpful – these are some of the words Doug's colleagues at Bald Mountain used to describe him. We all rely on IT to fulfill our jobs and Doug ensures that everyone at Bald Mountain has the equipment and support needed to be successful. It his positive attitude and willingness to help that make him invaluable to his site, and an excellent example of the values and culture at Kinross. Amadou is an experienced, multilingual and approachable person who has worked at Tasiast since Kinross acquired the mine in 2010. He first joined the Company as a pit dispatcher but moved to the position of Load and Haul supervisor in 2014. Amadou is a real polyglot who speaks three Mauritanian dialects in addition to English, French and Arabic. Although he speaks many languages, Amadou is a quiet and respected person who has earned the consideration and esteem of his managers and co-workers – a true example of a proud and accomplished Kinross employee. Trust, transparency, honesty and continuous improvement are principles that guide Bill's day-to-day work. Bill's extraordinary effort in designing and improving the world-class water treatment facilities at Kettle River-Buckhorn has greatly reduced our environmental impact at this small footprint mine. Bill has also collaborated with other sites and is continually developing new ideas for safe, reliable and efficient water treatment. Bill's innovations and expertise is a great example of what sustains Kinross' deep technical bench strength. Willing to help wherever it's needed – whether or not it typically fits into his job description – Justice has been involved in a variety of high priority initiatives at Chirano. Justice works with an infectious enthusiasm and spirit that goes beyond his role. Not only was he a LOVA winner, he was also the recipient of Chirano's "Best Worker Award in 2010". Justice goes over and beyond what is expected to succeed, and his goodwill is known throughout the site. Demonstrating by example, João is a results-oriented person who always strives to be better today than the day before, and better tomorrow than today. João was instrumental in the expansion project at Paracatu and his efforts have translated to helping Paracatu continually achieve strong results. With his exceptional work ethic and high standards, João inspires his team to always seek more. Kinross' shareholders, investors and analysts are fortunate to have Jennifer bridging the communication between them and the Company. Always positive and eager to help, Jennifer has the strong work ethic and ingenuity to solve whatever task is thrown her way. Jennifer started as a summer student over ten years ago and has deep knowledge about the Company and the industry. She may have inherited her passion for mining from her father, who also worked at Kinross during his long career in mining. Focused, productive, training-oriented and supportive of safe production – all characteristics Danny embodies. Danny is a dedicated leader and mentor to his team, checking in with them regularly and helping equip them with the skills and tools they will need to excel not only at their jobs, but also at home. In fact, Danny's entire team nominated him for the Living Our Values Award, a testament to Danny's leadership and character. It’s an exciting time to be at Kinross. We continue to deliver strong and consistent operating results from our diverse portfolio of mines located in three core regions: the Americas, West Africa and Russia. We have met our production and cost guidance for six consecutive years. We have exciting organic growth projects that are expected to bolster our long-term growth. Our strong balance sheet and liquidity position ensures we have the flexibility to invest in our future. We have deeply engrained Kinross' four values into our everyday work environment and these values underpin the unique and strong culture of our Company. We are very proud to reach and celebrate this significant milestone and confidently look forward to accomplishing our goals through hard work and dedication over the next 25 years. Kinross' strong operating results are driven by solid and consistent performance from a targeted portfolio of mines and projects located in three core regions: the Americas, West Africa and Russia. It has been a great privilege to be a part of Kinross Gold for the past 23 years. I was appointed to the Board of Directors in 1995 and since then I have seen this Company grow and evolve into one of the leading gold mining companies in the world. 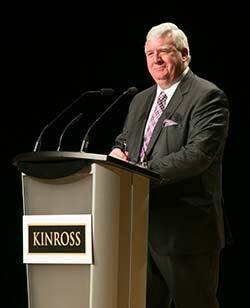 Back in 1995, Kinross was a small company, producing approximately 345,000 gold equivalent ounces, with 4.3 million ounces in estimated proven and probable reserves and just under 2,000 employees. Today, we have a strong global portfolio of operations that produced 2.67 million gold equivalent ounces in 2017, has approximately 26 million ounces in estimated proven and probable reserves, and more than 9,000 employees. Our systems have evolved to world-class levels and we have built impressive in-house bench strength that excels at operating in different environments. Our Company is committed to safety, operational excellence, financial discipline, corporate responsibility and environmental stewardship and I am very pleased to see these commitments demonstrated through our actions every day. Our people help ensure our Company operates to the highest ethical standards, which in turn defines our strong reputation. Our people are also our ambassadors and represent Kinross both at work and in the community – it is their hard work and commitment that drive our Company’s success. I remain confident about Kinross’ bright future. We have built a great company during the past 25 years and today, we have a solid foundation of assets, people and culture that I expect will continue to deliver value to all our stakeholders. We have exciting organic opportunities on the horizon and are in a strong financial position to capitalize on promising opportunities. I am immensely proud to celebrate the 25-year anniversary of Kinross and am excited about continuing to build on this great success.